This rap and hip-hop favourite is no stranger at working a room. 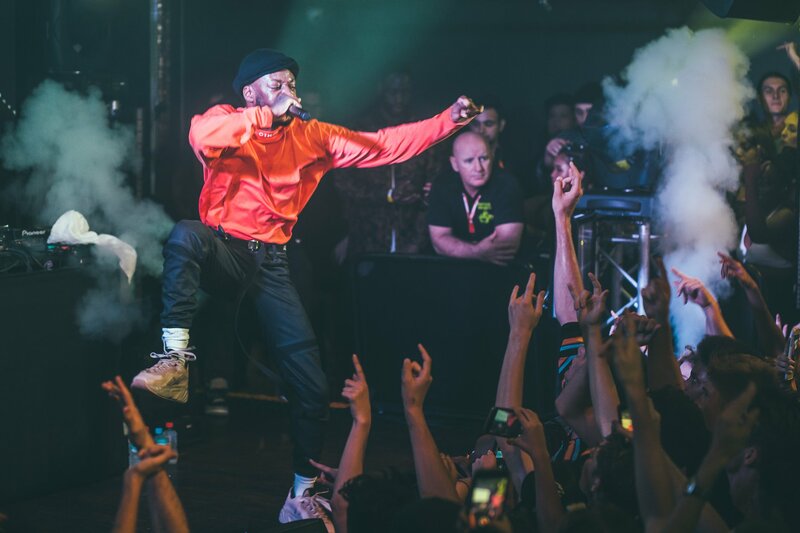 Performing to a sold-out crowd at Villa Nightclub on Thursday 30 March, GoldLink threw the dance party of the year. On the last leg of his ‘At What Cost’ tour around Australia and New Zealand, the DC rapper kept the energy high the whole night through with his razor sharp turn of phrase, charisma and endearing dance moves. Despite only being 24 years old, the rapper has established himself as a force to be reckoned with in the rap and hip-hop worlds. Over the course of his two albums, GoldLink has collaborated with high profile peers such as Kaytranada and Anderson Paak. His single with Brent Faiyaz and Shy Glizzy ‘Crew’ recently achieved platinum status and earned him a Grammy nomination for Best Rap/Sung Performance. Given his noteworthy achievements to date, it was no surprise that the energy in Villa Nightclub was electric. GoldLink set the tone for his hour-long set with the contagiously fun ‘Fall In Love’, which he followed with ‘Some Girl’ and ‘Rough Soul’. Performing favourites from both albums, GoldLink transitioned seamlessly from rap to hip-hop, soul and dance - a blend that has become his signature. ‘Herside Story’ and ‘Crew’ were unsurprisingly crowd favourites. Briefly straying from GoldLink’s repertoire, the crowd sang ‘Happy Birthday’ to a member of his entourage, which ended with the rapper throwing pieces of birthday cake into the audience and performing an encore of ‘Crew’. At one point, he even coaxed the crowd into forming a dance circle in the middle of the moshpit; there was no denying that GoldLink was no stranger at working a room. GoldLink’s dance moves were a highlight all in their own; his borderline dorky moves contrasted endearingly with the too-cool-for-school vibe he exuded in his cap, neon orange jumper and black jeans. Unfortunately, it was difficult to ignore that Villa Nightclub was too small a venue and hardly contained the crowd’s monstrous energy. However, this didn’t hinder GoldLink’s last Australian show from being an electric and energetic affair. Cover image courtesy of Mason Devine. Hi, I'm Julianne! In addition to waxing lyrical about Perth cafes and boutiques, my hobbies include spending all of my income on live music and fun pants. My favourite things about Perth are the beaches, the laid back lifestyle, and the crop of new brunch spots that appear every week.